This was the day for which we've been waiting! 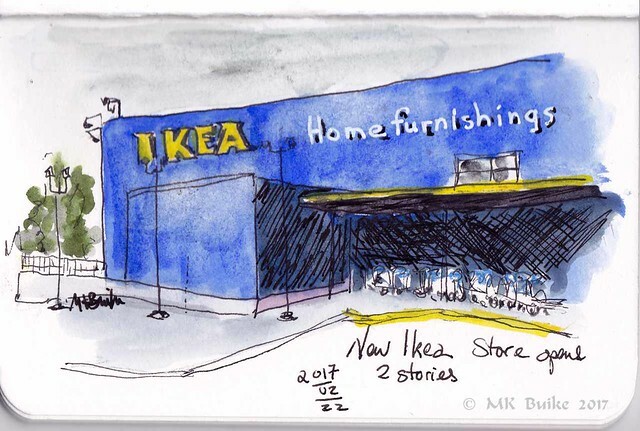 The new Ikea store opened this morning. It was built on the site of the parking lot of the old store. It is 2 stories and is 399,000 square feet. It has Washington’s largest rooftop solar array on the roof. More info about the store. The store was closed on Tuesday to prep for the opening today. During that closure, local non-profits were invited into the old store to take housewares for their clients. The value was about $57,000! I thought I would be late and miss the opening ceremony as I left home later than planned. Not only did I easily find parking, I still had several minutes to wait, even though my arrival was 10 minutes after the scheduled start! I lucked out. While I waited, I sketched in the background of the area for the ceremony. There was no ribbon cutting. As is supposedly Swedish tradition, a log was sawed for good luck. 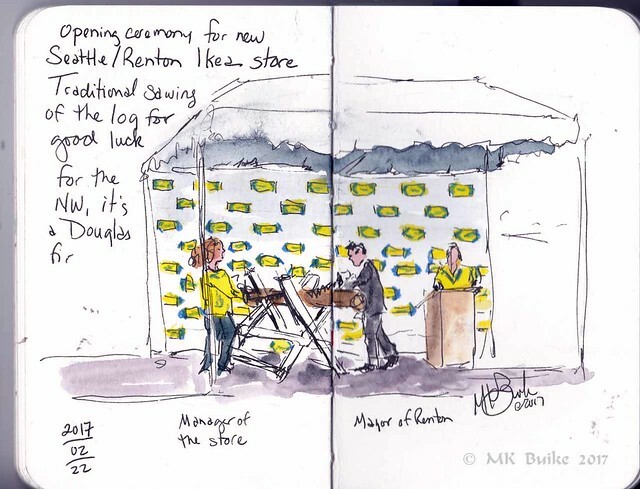 I quickly added in the store manager and the mayor sawing the log as it barely took a minute! Since I was there and the line of people waiting wasn't too long, I decided to take a look around. Everything seemed larger: the cafe, the warehouse, the number of carts. They even stock bicycles now! Afterwards I sketched a corner of the new, 2 story building. For both sketches, I used the Stillman and Birn softcover Beta pocket sketchbook (continuing to be inspired by Gabi's workshop).